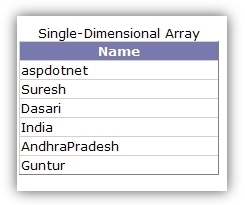 Here I will explain how to bind arraylist elements to gridview using asp.net. In my application we bind some of elements to arraylist items after that we need to bind that elements to gridview upto that I don’t have idea to bind arraylist to gridview. 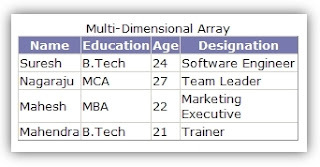 I searched many websites and I found good materials regarding how to bind arraylist items to our gridview. 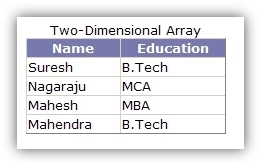 Now we will discuss about multi dimensional arrays code for multi demensional arrays same like our two dimensional arrays. this is very simple how use arrays.Thank u great job. A Job Well done ...! Really helped me .....! Very nice article. However your example of a 3 dimentional array is actually only a 2 dimentional array with extra columns. This post is truly inspirational. The problem is I can not use the asp.net. ur post are great plz keep it up..and save fresher's assess.